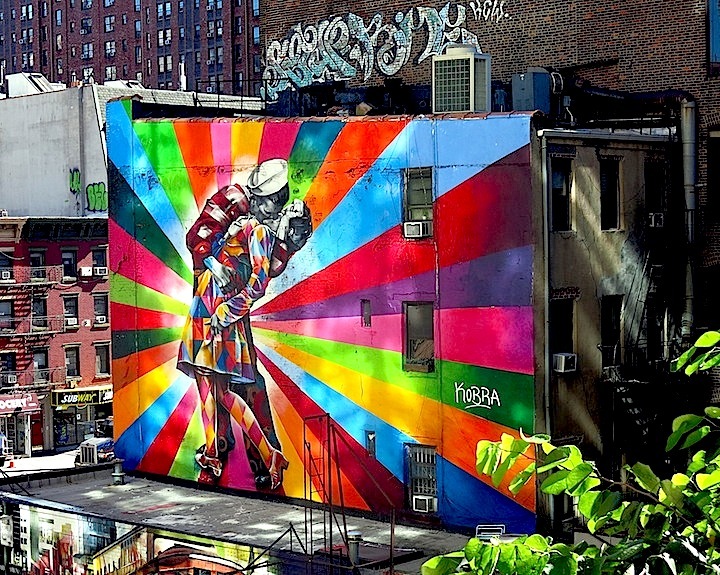 Street art is a part of the urban scene in New York and the Brazilian graffiti stands out thanks to the work of great artists, such as Eduardo Kobra and the identical twin brothers, Gustavo and Antônio Pandolfo, known as “Os Gêmeos” (twins in Portuguese). 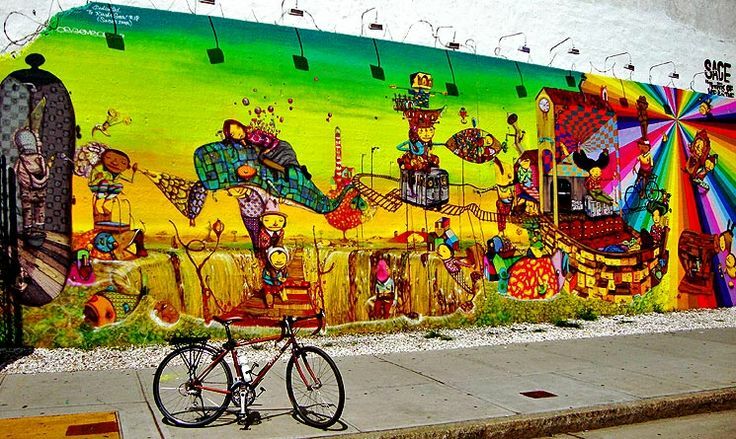 Over the last decade, Brazilians have painted a few murals in Manhattan and Brooklyn that quickly became touristic attractions. Kobra applies to his work a natural interest in antique books and photographs, recreating in large walls images of historic moments or iconic personalities. In the project “Murals of Memory”, he draws scenes of the past, offering to the public an imaginary window to a city that does not exist anymore. A variation of that project is the series “kaleidoscopes of color”, Kobra’s trademark, in which old images receive a new visual identity to be brought to our times. Os Gêmeos works, for their part, are filled with magical realism, inviting us to embark on a journey to a childish world of dreams, fantasies and references to Brazilian folklore. Some murals are like large scale picture books, with illustrations that remind us of the Flemish masters of Surrealism – Hieronymus Bosch and Mauritius Escher. Despite their differences in style and thematic, Kobra and the Brazilian brothers share a common background and purpose for their art. They were all raised in one of the world’s largest cities, São Paulo, where graffiti became a way to speak out, to create dialogue, to challenge the status quo and, ultimately, to “democratize” art. According to Kobra, the biggest pleasure about his job is to bring art to millions of people, regardless of their economic status. Although the Brazilian brothers also paint canvases and make sculptures for museums and galleries, their preferred environment is the street, where the social impact of their work is greater. As you make your way from one neighborhood to another in New York, there are four Brazilian murals that are worth seeking. • Kobra in Chelsea – This is perhaps the most famous Brazilian graffiti in New York, strategically located alongside the Highline, the elevated walkway in Chelsea flooded with tourists day and night. 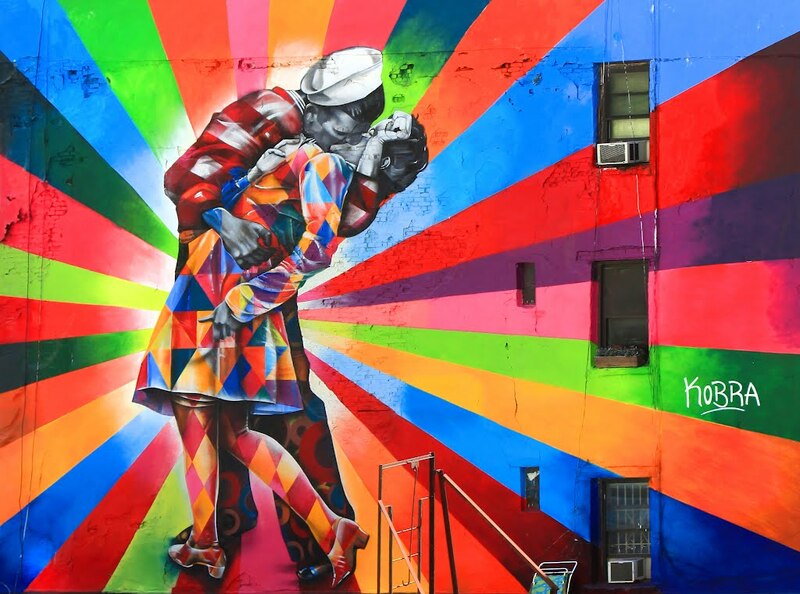 In this mural, Kobra takes on Alfred Eisenstaedt’s photo, in which a couple celebrates the end of World War II in Times Square, and transforms it into a rainbow of colors. The image symbolizes the explosion of love, which is the name of this mural. 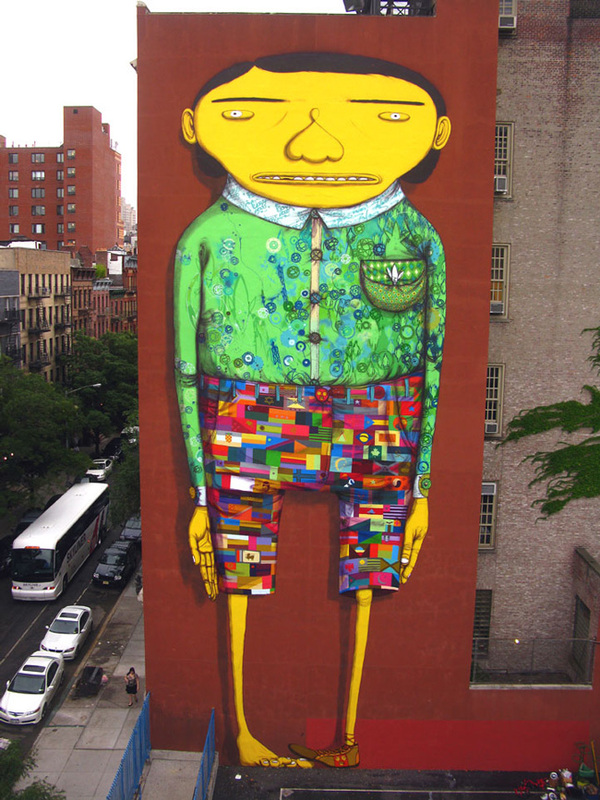 Os Gêmeos in Chelsea –The Brazilian brothers created a permanent mural on the façade of Public School 11, on 21st Street, in Chelsea depicting a giant over 80 feet high with numerous country flags on his shirt, all painted in altered colors. The image symbolizes unity and a world without borders, and is part of a larger project called “one world, one voice” – there are also murals of giants in other countries, like Greece, Germany, Portugal and Holland. Kobra in Williamsburg – At the neighborhood of Williamsburg, Kobra transformed the façade of an old brick building in a boxing rink. 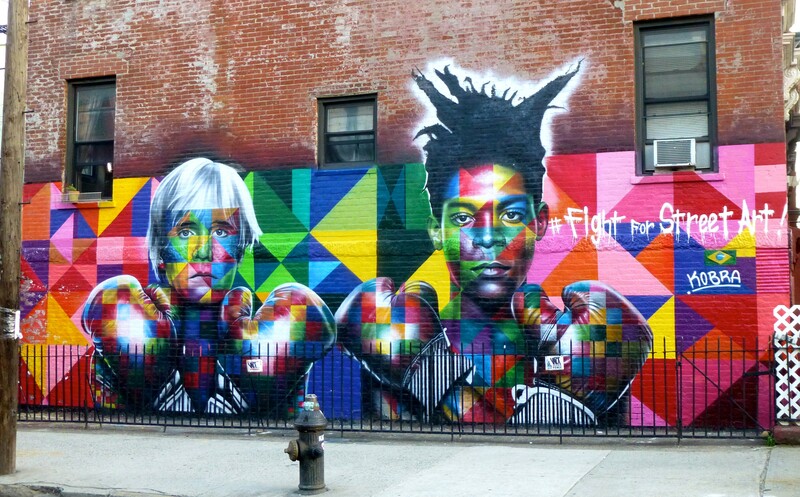 Side by side, staring down their viewers with boxing gloves crisscrossed are the pop-artist, Andy Warhol, and the graffiti master, Jean Michel Basquiat. The text reads “Fight for Street Art”. 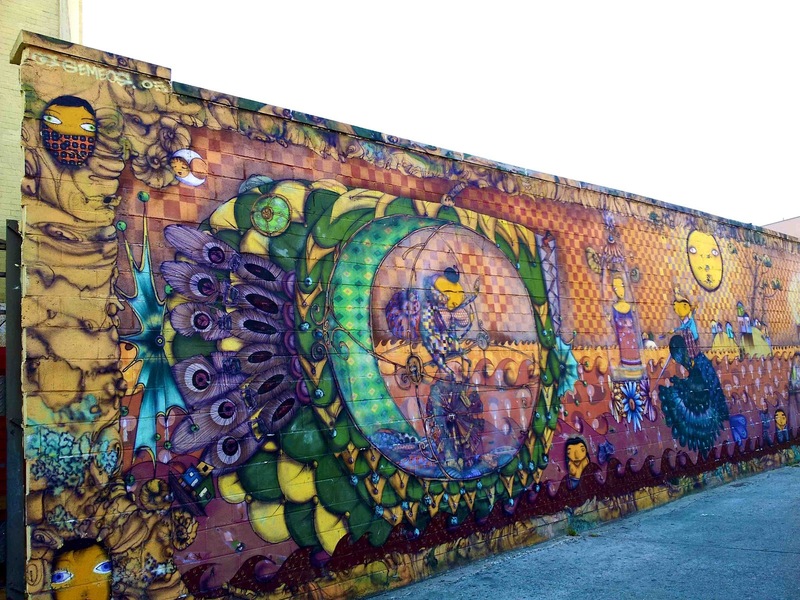 Os Gêmeos in Coney Island – The Brazilian brothers created a big permanent mural in front of the subway station at Stillwell Avenue, Coney Island. The project was sponsored by Creative Time and the Detch Gallery. Os Gêmeos in Chelsea, with Banksy – One indication of the great receptivity of the Brazilian brothers work is the fact that Banksy, the worldwide famous British street artist, invited them to make an installation during his latest stay in New York. 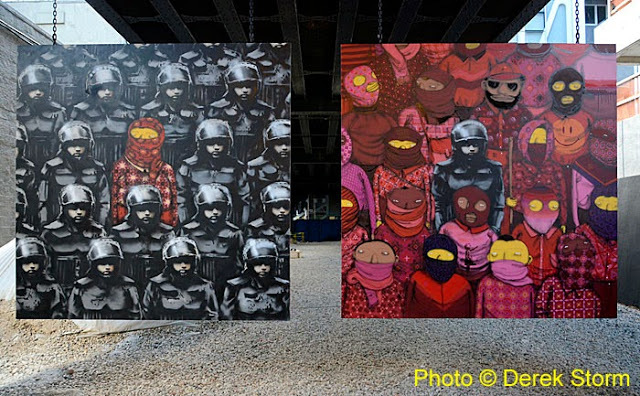 For a few days in 2013, the public could see two large paintings hanging beneath the Highline (Chelsea). The two canvases combine Banksy’s stencil style with the yellow-tinged, cartoonish people Os Gêmeos made famous on the streets of São Paulo.